On our first visit our engineer will carry out a condition survey of all assets, testing them and providing them with an operational & condition rating of between 1 & 6. A rating of 1 would indicate the asset is in excellent operating condition. A rating of 6 would indicate the asset should be budgeted for replacement and we will provide prices and a schedule for this. Next our engineer would make a record of all the key components of the asset, including serial & product numbers and the manufacturer. We will also list suggested consumable items such as filters and belts that should be carried as on site spares or included in further service visits. Our online database, simPRO, has a fully functional Customer Portal. This will enable you to view all outstanding jobs, quotations, job history including asset test history and your financial account. 1. 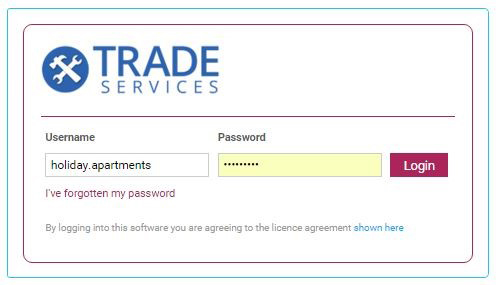 Click the customer portal URL we sent you. A page similar to the above screenshot will load. 2. Enter the Username and Password we sent you. After you have logged in, you will be taken to the main screen of the portal, to the Pending Jobs page. Your name will appear in the top right corner, next to the Logout icon. The main menu options display across the top of the screen. 1. Hover over Quotes at the top of the page. 2. Click Outstanding or Actioned, depending on the quotes you wish to view. 3. View Quote details as required. To find a specific quote, enter a quote number in the search bar and click Search. 1. Hover over Jobs at the top of the page. 2. Click the stage you want to view, such as Pending or Complete. 3. View Job details as required. To find a specific job, enter a job number in the search bar and click Search. 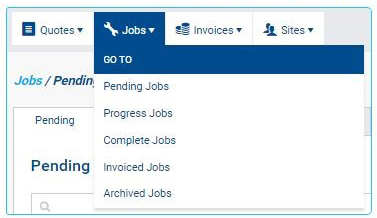 To switch between Pending, Progress, Complete, Invoiced and Active jobs, click the appropriate sub-tab. To print a quote, click Options > Print Job. 1. Hover over Invoices at the top of the page. 2. Click Unpaid or Paid, depending on the invoices you wish to view. 3. View invoice details as required. To find a specific invoice, enter an invoice or job number in the search bar and click Search. To switch between All, Paid and Unpaid invoices, click the appropriate sub-tab. 3. View statement details as required. After you have requested a quote, go to Quotes > Outstanding to view it. Once we have received and actioned the quote, it will appear under Quotes > Actioned instead, with the estimated Cost included. Once a quote has been approved, you can add attachments by clicking Options > Attachments. After you have booked a job, go to Jobs > Pending to view it. Once we have scheduled the job, it will appear under Jobs > Progress Jobs instead, and will display the Scheduled date. If you hover over its Status, you will see it has changed from ‘Job : New Service’ to ‘Job : In Progress’. After the job is complete it will appear in Jobs > Complete, after it has been invoiced it will appear under Jobs > Invoiced, and after the invoice has been paid it will appear under Jobs > Archive. View detailed information about your assets, including service and transfer history, and request a quote or book a job directly from an asset requiring maintenance to automatically assign it to a quote / job. 1. Hover over Assets at the top of the page. 3. Click the Site you wish to view assets for. 4. Assets are grouped by type. Scroll to find the asset or enter the asset number in to the Search Bar and click Search. 5. Click the asset. It will open in a pop-up window. 6. View the Service History details as required. 7. Click the Transfer History to view transfer information as required. 8. When you have finished close the window by clicking the X in the top right corner. To download a list of asset details, click the icon in the top right corner and click CSV. Find out more detailed information about your assets by viewing reports. Reports include the Programmed Preventative Maintenance Report, the Defect Report and the Test History Report. 1. Hover over Reports at the top of the page. 2. Click the report you wish to view. 3. Filter results by selecting options from the drop-down lists. 5. View report results as required. After the first service a full F Gas register will be provided where applicable. Each service will be carried out to the service schedules as listed. All this will be entered onto our simPRO Database. All asset service reports are configurable to match each clients needs.